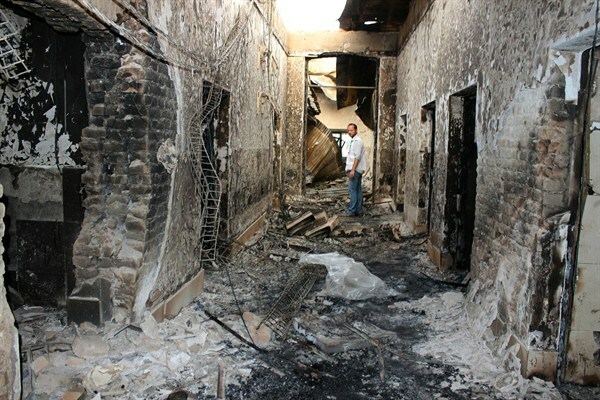 Are Attacks on Health Care Facilities the New Normal in War Zones? An employee of Doctors Without Borders stands inside the charred remains of their hospital after it was hit by a U.S. airstrike, Kunduz, Afghanistan, Oct. 16, 2015 (AP photo by Najim Rahim). Once taboo, the targeting of hospitals and health care providers in wartime has become such a frequent occurrence in today’s conflict zones that Doctors Without Borders, the humanitarian aid organization that goes by its French acronym MSF, now calls it the new normal. Attacks that previously seemed to occur unintentionally or sporadically now appear to be a deliberate strategy of war. This is particularly the case in Syria and Yemen, where hospitals and doctors are targeted so often that medical care now has to be provided in places such as caves and chicken coops in order to avoid detection by warring factions.